This year, Mecum will offer a K2 and a K3 in their annual auction at the Hyatt Regency in Monterey on Saturday August 18. Keen observers will note that the K3 looks familiar. 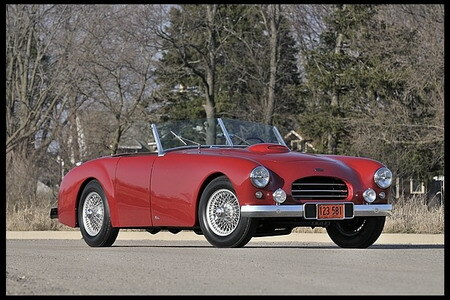 The car, chassis #3182 was sold at Mecum's spring auction in Indianopolis. There must have been a problem with the sale since it is being offered up once again. 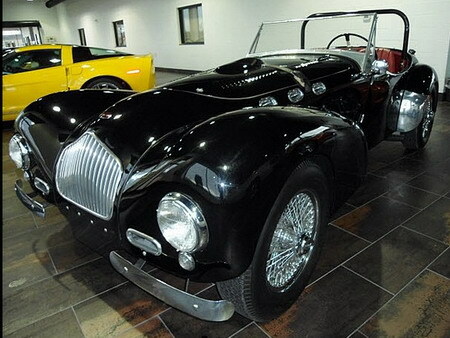 To review, this K3 was ordered on 9-9-52 and shipped on 5-25-53 to Noel Kirk Motors in Los Angeles. The car had “bright red” paint with black leather interior and disc wheels. It was shipped with Cadillac engine modifications. The car is currently painted burgundy with brown interior and was converted to wire wheels. Powered is delivered via a Cadillac 331 and automatic transmission. It should be noted that the left hand shift linkage (between driver & door) has been retained with the automatic transmission conversion. The K3 is listed as lot S127 and is estimated to sell around 2:40pm. Click here or the photo above to visit Mecum's site. K2 chassis #3127 was one of the last K2's built. It was delivered to Noel Kirk motors on October 7, 1952. It was originally painted beige with brown interior, but later repainted black and upolstered in red. The car is equipped with a dual carb Cadillac engine with what is assumed to be a stock Ford 3-speed transmission. The K2 is listed as lot S169 and is estimated to sell around 4:15pm. Click here or the photo above to visit Mecum's site.